For three-season backpacking, my choice of a stove is simple: A canister if I am feeling lazy. Alcohol if I know I am pounding out the mileage on the trail with a friend. Or none at all if solo. When winter backpacking in Colorado? The above stoves do not fit my needs. I am melting a lot of snow for hot water and need something that is efficient in cold weather. I take a white gas stove. One of the challenges of backpacking in winter is the snow. In particular, where to stick your stove on it. When you light your stove, the heat will cause the stove to sink into the snow as it is heating up your glop du jour. No fun. A few tried and true methods have been used by people over the years: Bottom of an avy shovel, an old license plate, plywood, commercial solutions and even foil wrapped cardboard. But, I found a solution that uses material found in a typical backpacker’s gear closet and kitchen, does not cost much at all and takes minutes to make. It is simple, cheap, effective and light. As a bonus, this dirt bagger design works as a heat reflector, too. 2. Cover 9″ x 9″ foam pad with foil. This size works well for my stove and pot. As mentioned, the advantage of this setup is that it also reflects back the heat. Reflected heat, of course, helps heat the water and/or food faster. Which in turn saves precious fuel. In my use, I find the foil covered foam reflects the heat with no issues. This dirt bagger special weighs ~ 1.5 oz. In use in RMNP by Andrew Skurka. 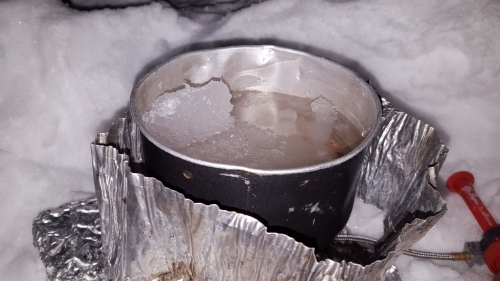 While it would not be my first choice for deep winter camping, this stove base will also work with an alcohol stove. DO NOT use this stove platform with a canister stove such as an MSR Pocket Rocket. A remote canister stove such as an MSR Windpro should be fine, however. We’re not ultralite fanatics so we usually stick with white gas for throughout the year. Mags, Would it make a Caldera Cone/Alchy stove to hot? (melt or something like that?) Thanks, BUD! I don’t think so. The heat output from a white gas stove is considerably more. I also suspect you won’t be using the alchie stove for nearly as long (less than 10 minutes?). Unless you are using the alchie stove for winter, this little setup may be overkill though.